Since the end of the Governorship election that was held on July 14, 2012, calm is yet to return to the ancient city of the old BiniKingdom. It will be recalled that an overtly destructive electoral campaign that bore all the hallmarks of an electoral war of attrition, saw the re-emergence of Governor Oshiomole in Government house in a landslide victory. The center-stage of acrimony was occupied by the feud between the action and voluble showman Governor and the aging but ever-agile cunning figure of the PDP Tony Anennih. The election has come and gone but the dark bubbles of the boiling broth keep shooting up and bursting in the middle of the political cauldron. Simple logic instructed every discerning mind that anything short of an Oshiomole’s victory for a second term in Government house was sheer impossible. Yet observers were stunned at what scientific polls revealed shortly before ballot casting. The prediction came true. It was a landslide victory and not the tight race that observers expected. Unfortunately however, the opposition’s candidate challenging for the office would have none of it. Retired General Airhiavbere simply refused to be swayed by the strength of the people’s choice. He challenged the final count. His challenge has however, not stood a single chance of reversing his fortunes since the figures involved will simply be insufficient to fault the credibility of the people’s choice. General Airhiavbere subsequently took to investigative researching and today, accusations that Governor Oshiomole has no proper primary or secondary school qualification is no news any longer. Unverified information from sources close to the events explains that the relevant documents and information were handed out to some media houses and select journalists to buttress the charges. Governor Oshiomole is reported to have gotten wind of General Airhiavbere’s findings and plans at a very early stage of the General’s endeavors. He moved swiftly to arrest the situation and requested monarchical intervention. In the aftermath of the intervention of the Oba of Benin, who called on the President to prevail on General Airhiavbere, a rapprochement was arranged between the Governor and old man Tony Anennih. Wild undercurrent speculations that cannot be verified claim that up to Naira 2 billion changed hands to secure Tony Anennih’s cooperation. It was no surprise afterwards that the Governor who was entrenched in long-running acrimony with the old man Anennih suddenly released a newspaper advert congratulating the old man on his 79th birthday. In the end, The PDP refused to join General Airhiavbere in his suit challenging the validity of Governor Oshiomole’s re-election. Moreover, cabinet members were also to be drawn from the PDP in the Governor’s second term. President Jonathan was said to have gone for this deal in view of Governor Oshiomole’s usefulness to the President in bargaining with Labor Unions. 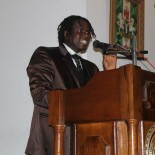 General Airhiavbere thus filed his suit as a defeated candidate and sole challenger without party support. In the past few weeks however, sources have been reporting a general mood of discontent in Benin City. Newly fixed roads that served as the pride of government’s achievements are said to be falling back to their old pothole states while pending projects seem to be standing on hold after a lavish electoral campaign. The situation is said to be further compounded by the fact that accusations are backed by sound evidences, claiming that the Governor faked attendance of a primary school (Iyamoh Primary School) that was founded in 1976, 14 years after he was supposed to have graduated from the same school. The modern school certificate tendered by the Governor is claimed to be fake since the challenger’s camp claim to have evidences that the Governor dropped out of Blessed St. Martin’s Secondary Modern School, which certificate he had also tendered. Be that as it may though, the situation has become a breeding ground for very wild speculations and the general mood in the state is said to be turning into popular anger. If a Governor elected on the strength of qualifications that were constitutionally required, turns out to have lacked such qualifications in the end, he faces automatic and undisputable post-electoral disqualification. Observers have even speculated that this was a viable card that Professor Osunbor could have played if he was not sabotaged by late President Umaru Musa Yar’Adua and the Tony Anennih-led PDP. Now the rumor mill is swirling and selling the story that up to N 150 million changed hands somewhere to facilitate a favorable ruling from the Electoral Tribunal on the certificate saga. The ruling was finally made by the tribunal and the case was dismissed on the grounds that the issue is a pre-election one. It was adjudged an issue that should have been resolved prior to the election and should have no further relevance after the election. In his reaction, General Airhiavbere has not only appealed the ruling but has also petitioned the National Judicial Council (NJC) headed by the new ‘no-nonsense’ Chief Justice of Nigeria Aloma Mariam Mukhtar. The petition is said to have listed a number of instances that the Head of the Electoral Tribunal Justice Suleiman Ambusa erred in law in passing his judgment. It can therefore be assumed that a minimum of the “Primary School Certificate level” is expected for Governorship since there is no other “School Certificate” lower than the Primary School Leaving Certificate in Nigeria. Anxiety is therefore gripping informed quarters that the Governor will most likely, not be sworn in on the appointed date in November. Worse still, the Presidency is reported to be nursing a change of heart to ditch the action Governor and all privately agreed cooperation. The Secretary of the PDP in EdoState is reported to have now expressed readiness to testify in the appeal hearings and any other investigations following the NJC querying of the Election Tribunal in a clear departure from the PDP’s position not to be a party to General Airhiavbere’s legal suit. Readers are however warned that parts of the information above (especially excerpts from the rumor mill) are highly speculative and could not be verified. In fact, my telephone conversation with Dr. Simon Omoaka Imuekemhe – Secretary to the Edo State Government – was abruptly cut short today, after he had told me that no government functionary would be ready to exchange views with me on this issue since it was pending in court and may be sub-judicial. Our efforts to provide a balanced account thus hit a brick wall. This entry was posted on October 15, 2012 by Frisky Larr.